We’re honored to announce that the University of Dubuque has commissioned our Op. 97 for John and Alice Butler Hall in the University’s Heritage Center. A gift of the Hall donors, the new organ serves as UD’s main recital and teaching instrument. Installation is planned for 2020. Construction of our Op. 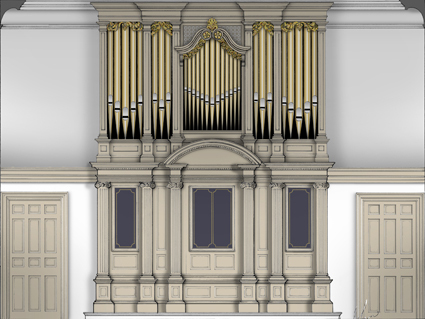 96, a new instrument for Bruton Parish Church, in historic Williamsburg, Virginia, is well underway. Founded in 1674, the parish worships in its 1715 church, which was designated a National Historic Landmark in 1970 and is one of the most recognizable structures of Colonial Williamsburg. Bruton Parish Church has a lengthy organ history. The makers of the first organs, from 1756 and 1840, are unknown. At the dawn of the 20th century, the Hutchings-Votey Organ Co. provided a new instrument, some pipes of which were retained in Op. 968 of the Aeolian-Skinner Organ Co. That instrument, rebuilt on six occasions since its construction in 1937 and growing from 13 ranks to 105, is crowded into the attic, the east gallery of the church, the case of a 1785 organ by Samuel Green that was added in 1939, and the church tower. 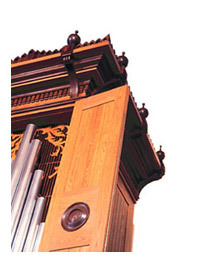 Faced with increasing mechanical unreliability and advised by several consultants that a new, smaller organ more advantageously placed would yield both musical and maintenance benefits, the parish undertook a search for an organ builder. That process came to its conclusion in February 2016 with the signing of a contract between Bruton Parish Church and Dobson. The new organ will stand in the east gallery, above the reredos, in the space currently occupied by the Green organ case. The design of the new organ case takes its cue from the historic reredos, which was restored in 1939. The case will be painted the same putty-gray color as the reredos. The tin façade pipes and the carved pipe shades will be gilded. The Great and Positive divisions, and some pipes of the Pedal, will stand in the visible case. 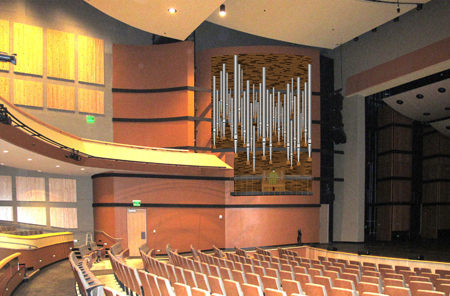 The Swell and largest pipes of the Pedal will be located immediately above the case and speak through the ceiling grilles. 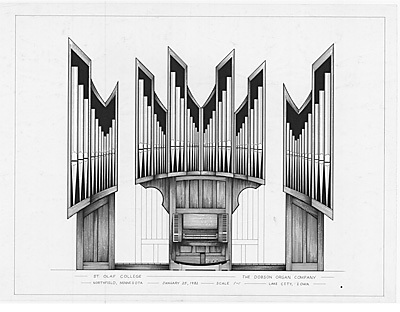 Because of architectural constraints, the organ will have electric action. 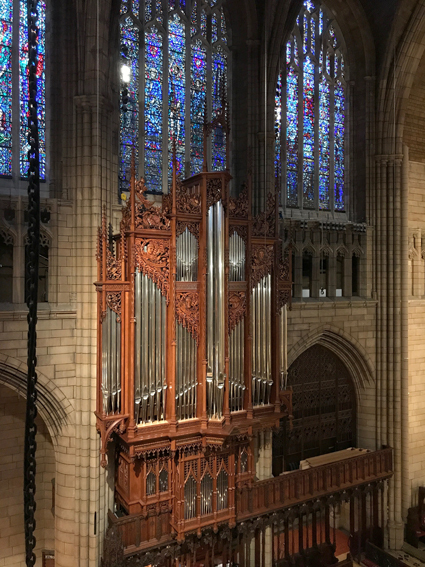 Installation of the organ is scheduled to begin in Spring 2019. The Rev’d. Christopher L. Epperson is the Rector of Bruton Parish Church. Rebecca Davy is Music Director & Organist, and JanEl Will is Organist; James Darling is Choirmaster-Organist Emeritus. Installation of our Op. 93 for Saint Thomas Church in New York City commenced in May 2017 and tonal finishing began in September. Completion is anticipated in late summer 2018. An important part of the project has been the creation of carvings that are a part of the new organ case. Across the chancel, Bertram Goodhue’s glorious case of 1913 has been fitted with new, speaking tin façade pipes. Dedication festivities have been set for the first weekend in October 2018. Daniel Hyde, Saint Thomas Church’s Organist and Director of Music will play the dedication recital on Friday 5 October; Benjamin Sheen, Associate Organist, will be the soloist in an 18 October concert that includes concertos by Poulenc and Barber, as well as Parry’s Blest Pair of Sirens, Janacek’s Otcenas, and Bernstein’s Chichester Psalms. In 2009, in celebration of our company’s 35th anniversary, we made an online exhibit of some of Lynn Dobson’s drawings. One of the most highly-regarded case designers of his generation, Dobson has proved to be equally at home in modern or historically-inspired idioms. Lynn A. Dobson: Drawings & Projects presents a selection of work from 19742009, and includes unrealized designs as well as built instruments. Searching for a previous News item? Older entries can be found in our News Archive.